If Elvis could express gratitude to millions of fans with the expression, can’t you write it on a measly piece of paper to show your appreciation?! In life, I try to constantly tell myself that just because I would do something a certain way, doesn’t mean someone else must do the same. I used to file thank you notes under that category, but I’m putting my foot down. Enough already, it’s just plain rude! If someone gives you a gift, has you over for dinner, or just does something really nice, whatever it may be, they deserve a thank you card. Period. There is no excuse. Of course this is just my personal opinion but if you ask me…I’ll tell you I’m very rarely wrong. Haha! My blog, my rules. But seriously people, if someone took the time and forethought to do one of the aforementioned things for you, then certainly you can take the time to write a few words on a card, put it in an envelope and drop it in the mailbox. Don’t forget your stamp! I suppose in this day and age even a virtual thank-you via email, e-card, or text is acceptable…it wouldn’t be my first choice but based on today’s etiquette, I’ll take what I can get. Please know that my intention is not to call anyone out or point fingers…so if you’re reading this and feeling a twinge of guilt, it’s your fault, not mine! There is nothing more appreciated than a lovely handwritten thank-you note. Some tips from Peggy Post on turning this obligation into a pleasure not a chore. When should notes be written? Contrary to popular myth, the happy couple does not have a year’s grace period. 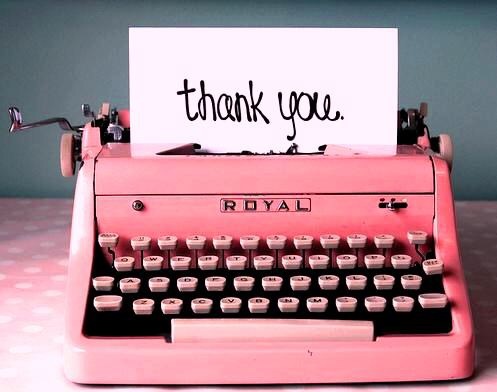 All thank you notes should be written within three months of the receipt of the gift. Ideally, a response should be written on the day you receive a wedding gift. If that’s not possible, set a daily goal. It’s a lot easier to write three or four notes a day than to have to write a hundred notes in a month after the wedding! What stationery should be used? First of all, stationery is the operative word here: No fill-in-the-blank cards, no pre-printed cards, no phone calls, no emails, and no generic post on your website! Anyone who gives you an engagement, shower or wedding gift, even if you have thanked them in person. Individual notes should be written to people who contributed to a group gift. Your attendants. A warm personal note attached to your gifts to your attendants will let them know how much you appreciate their efforts and support on your behalf. Anyone who hosted a party or shower for you. Ideally these notes should be written within two days of the event. Each host or hostess should be thanked individually with a note and a thank you gift. People who house or entertain your wedding guests. A note and a small gift should be sent to anyone who houses or entertains out-of-town wedding guests. People who do kindnesses for you. The neighbor who accepts delivery of your gifts when you are at work; the cousin who supervises the parking at the reception – anyone who assists you before, during or after your wedding. Suppliers and vendors. You don’t have to write everyone you hire for services, butanyone who exceeds your expectations will appreciate a courteous note of thanks. Your parents or whoever is hosting your wedding. Do personalize your notes and make reference to the person as well as the gift. Do remember that a gift should be acknowledged with the same courtesy and generous spirit in which it was given. Do be enthusiastic, but don’t gush. Avoid saying a gift is the most beautiful thing you have ever seen unless you really mean it. Don’t send form letters or cards with printed messages and just your signature; don’t use email or post a generic thank you on your wedding web site in lieu of a personal note. Do promptly acknowledge the receipt of shipped gifts by sending a note right away or calling and following up with a written note in a day or two. Don’t mention that you plan to return a gift or that you are dissatisfied in any way. Don’t tailor your note to the perceived value of the gift; no one should receive a perfunctory note. Do refer to the way you will use a gift of money. Mentioning the amount is optional. Don’t include wedding photos or use photo cards if it will delay sending the note. Don’t use being late as an excuse not to write. Even if you are still sending notes after your first anniversary, keep writing! Even though the above tips are geared for brides, I feel they are a great guideline for anyone who is rendered an act of kindness and wishes to show their gratitude. Make it fun for yourself, get some cute cards from the store, or even get crafty and make your own! Keep them in a box with a fancy pen, your address book, and stamps, that way you’re all ready to go! Happy thanking! Couldn’t agree more! Let’s hold on to some ppl skills!